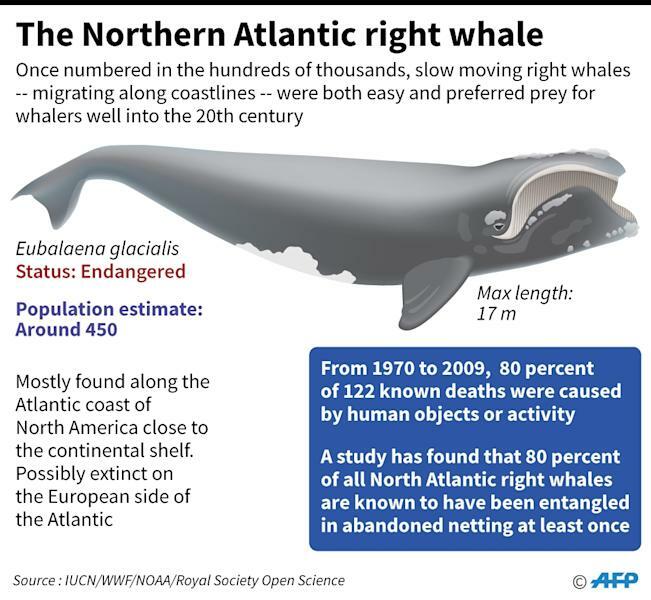 Paris (AFP) - When an endangered female North Atlantic right whale spends months, even years, disentangling itself from cast-off fishing nets, there's not much energy left over for mating and nursing calves. Coping with such debris, along with ship collisions and other forms of human encroachment, have severely stymied recovery of the majestic sea mammals long after explosive harpoons and factory ships nearly wiped them out, according to a study published Wednesday. Once numbering in the tens of thousands, the northern whale's population -- hovering around 450 today -- climbed slowly from 1990, but began to drop again around 2010. Had the Canadian and US waters they plied during that quarter of a century been pristine and uncluttered by human traffic, "the species' numbers would be almost double what they are now, and their current emergency wouldn't be so dire," scientists led by Peter Corkeron of the NOAA Northeastern Fisheries Science Center in Massachusetts reported. More to the point, there would be twice as many female whales: "The general slope of the recovery trajectory is driven by female mortality," they added. From 1970 to 2009, 80 percent of 122 known North Atlantic right whale deaths were caused by human objects or activity. The species has not been hunted for more than half a century. But beyond the number of whales killed was the question of whether the species' population might have been curtailed in more subtle ways by people. To find out, Corkeron compared birth rates with the Southern right whale, a sister species in the southern hemisphere -- estimated to number about 15,000 -- that is in much better shape and far less exposed to harmful human emanations. Data gathered over the last three decades made it possible to count the number of new calves born in different sub-populations at both poles. The Northern and Southern whales were long thought to be one species until genetic analysis showed otherwise. As suspected, the three groups of Southern whales -- off the coasts of eastern South America, southern Africa and southwest Australia -- produced offspring at twice the rate as their northern kin. Further evidence that the North Atlantic environment was taking a toll was the poor health of females and their calves, the study found. "That female baleen whales forgo reproduction in response to poor body conditions is well established," the authors said. What caused the lacerations, reduced body weight, and apparent unwillingness to mate? The most likely culprit is "ghost nets", sprawling webs of fishing gear often made of synthetic fibres as strong as they are long-lasting, the study concluded. 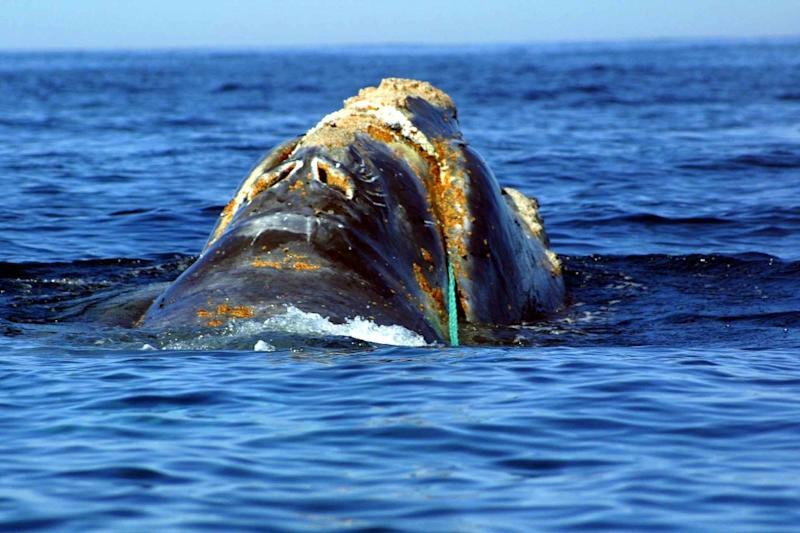 More than 80 percent of all North Atlantic right whales are known to have been entangled in abandoned netting at least once, and well over half have been there twice or more. "Entanglements can last from months to years, and recovery can take a similar time," the authors wrote in Royal Society Open Science. For the Southern whales, the problem is non-existent. Once numbered in the hundreds of thousands, slow moving right whales -- migrating along coastlines -- were both easy and preferred prey for whalers well into the 20th century. The species can grow to 20 metres (65 feet) and weigh 100 tonnes, more than a fully-loaded commercial jet. They are also docile and full of the blubber from which whale oil was made.